This major ’bricks & mortar’ casino operator was one of the first to enter into the online casino scene. Ritz Club remains true to their exclusive clientele and offers some of the biggest bonuses with wagering requirements that will ward off any riff raff. High rollers will also appreciate the low edge VIP tables offering single deck Blackjack & VIP Roulette and particularly major players can request to have their deposit limits increased. New users get an instant £100 sign up bonus ). However the wagering requirement for the full £100 bonus is £4,000 (40x bonus), so this is not a bonus for the casual player. Existing users can also get a very generous £100 monthly bonus by depositing £100 and wagering £4000. Although offered by many other casinos, the kind of players attracted to Ritz may actually make use of the loyalty points awarded here. Whilst it only works out at 1p for every £10 wagered, high rollers should be able to quickly accumulate and redeem these points because they are awarded based on wagers rather than wins or loses. 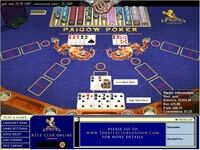 Some games such as multi-player roulette offer returns of 3p for every £10 wagered. Reward scheme pays at least 1p for every £10 wagered. Featuring just over 70 games, the Ritz Club does away with most of the Las Vegas style slot and video poker variants to concentrate on the ’proper’ casino games to create a gentleman’s club. There are a couple of less common casino games, but by far the main benefit of playing Ritz Club games is in their level of realism. 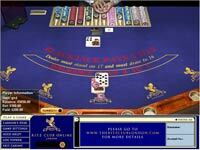 Games are run using the superb Cryptologic software and the casino features low edge variants of the most popular table games. Ritz Club offers a VIP single deck version of it’s Atlantic City Blackjack game and VIP Roulette which features the French ’en prision’ rules where half of your outside bets are returned when a zero is spun in. So far it is the only casino we have come across to allow bets on Roulette to count towards your bonus wagering quotas. It is not quantity but quality that counts and we are very impressed by the games offering at Ritz. Unfortunately it’s for players with deep pockets. As with all Wagerloic casinos, Ritz Club uses Ecash Direct to process all it’s payments & withdrawals, accepting credit/debit cards, wire transfer and .We recommend you use debit cards as it is the simplest method with the least hassles. Ecash Direct is also very simple to use. Withdrawals are very prompt, usually within 24hrs in our experience, but for added security you must wait for your PIN to arrive by post before you can withdraw. Minimum withdrawal of £20 for card (different terms for other methods). Ritz Club offers support by both email and telephone (free phone). Enquiries relating to your account & banking needs to be directed to Ecash Direct (a subsidiary of Wagerloic). Service from call centre can vary but we are very pleased to find the phones are manned by some very eager & knowledgeable people, but if you find yourself in a telephone queue, they will get back to any emails within 24hrs.